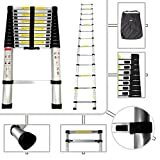 One of the most popular ranges of 3.8m telescopic ladders is the SOTECH 3.8m telescopic ladder which comes fully packaged with its carry bag and accessories to help you get going with your DIY activities. Most modern day telescopic ladders come fully assembled and ready to work with as soon as you have taken delivery of it. Make sure you check the manual and ensure everything in the consignments matches with what has been promised and if you find something not being right, report it straight away as some products could have faults or could be damaged on transit and hence, it is recommended to do the checking instead of just storing it away upon delivery. There are different sizes of telescopic ladders from different manufacturers available in the market, however, for basic domestic activities, the 3.8M telescopic ladder tends to be quite sufficient which is why the vast majority of shoppers prefer going for this size. First look at the design, it must be solidly built, with no play in the telescoping tubes of the ladder. Second, examine the material it is made of. Aluminium alloy is the norm, check the specifications; a good ladder will have at least a sheet tube thickness of 1.5mm at least. A tag or description brochure will have this information. Third, look at the base of the telescoping ladder, the first steps tube must be at least 66 mm in diameter. A smaller diameter means the higher tubes can be dangerously thin. I have seen off brand ladders bend under a heavy weight load at the highest steps. Fourth, select a ladder that comes with rubber feet, for safety and a solid grip. Fifth, overall if possible, pick a heavier 6063 aluminium unit. It means it uses the heavier alloy and will meet the higher weight capacity rating. It is also lighter in weight and corrosion resistant. Sixth and maybe the most important feature: make certain the telescoping ladder you pick is certified by either ANSI A14.2 Type 1A, and or EN131. Do not accept any other unknown certification, as they maybe their own factory manufacturer certifications, which because they are issued by themselves are really meaningless.